Aruna graduated in English from IndraprasthaCollege for Women in 1965 and joined the University of Delhi for post-graduate studies. 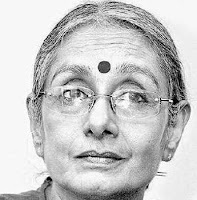 She spent one year teaching at Indraprastha College, during which period she passed the Indian Administrative Services ( IAS ) examinations in 1967.One of her classmates during post-graduate studies at Delhi university was Sanjit Roy, another left-wing social activist, whom she married in 1970. Before being wed, Sanjit and Aruna agreed on various conditions that would govern their married life.